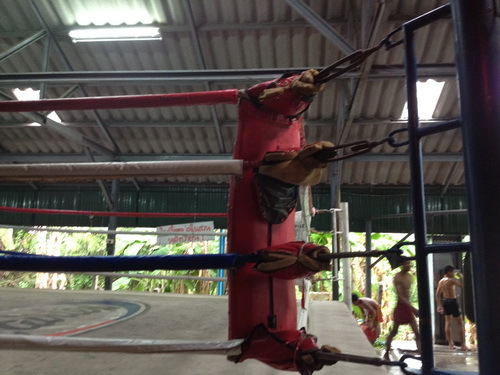 Muay Thai in Thailand , you can get a lot of skill in short time . The Muay Thai is basically a skill that is totally based on the sports, if you totally focus o the training that you are getting then in the matter of some small time you can actually get a lot of skills in the small time of the period. Focusing on your practice all the time when you are getting the training in the camp can actually help you to get a bunch of high skills. By the help of continuous training you will be able to get the things faster handled at your hand. When you are trying to get the training camp try having your fist session of the training at the real easy hand. After some time you can get your training harder and faster that will help you get the more control on all of your Muay Thai training all over. This entry was posted in Uncategorized on 2014/07/14 by muay thai fighter. “Kote” Paranchai Aditepwarapan come to stop the new that he reasy to send Sink Parandchai Muay Thai training camp , his beloved boxer to gamble with anyone in the weight 113 pounds. He want to understand with Muay Thai life that he come to this circle again is not for gamble but because he love the art of Thailand boxing. He comes to promote the south of boxing and the former boxer who make a reputation for Thung Song, Nakhon Si Thammarat, which “Kokiati” Somkiat sengprasit understand. “I am uncomfortable with the news that he want to gamble and ready to send Sink Paranchai Muay Thai training camp fight with anyone in the weight 113 pounds. In fact, Sink Paranchai Muay Thai training camp bet with Jaoinsee because I want to create a colorful to boxing and make the steam for Mr.chun and make an agreement with Kokiat from my clear heart and goal. I come to support boxer and make a work by support boxer to have the good future, encourage the head to do boxing, make a work for the old former boxer. I am ready to support boxer to make the reputation. My goal is to create top boxer for the south. This is a true story. I did not come to gamble like many people understand. Thank you “Kokiat” to understand me” Kote open mind. This entry was posted in Uncategorized on 2014/07/13 by muay thai fighter. It is glad for form of “Kanesarn”. Kan Esarn Sitaekubon has showed the excellent form to defeat Liamphet S. Thianpho until the committees commanded to stop fighting ; moreover, he has showed his great form to pass into King Fighter Round to fight in 39 kg. Besides, the trainer Pit revealed that Kan Esarn is indeed the grandson of Satanmeunglek Chanewitkosrang or another severe boxer of Suek Phetyindee. The teamwork of Champ Sitperm said that in King fighter round fighting in 39 kg. of Nong Boat or Nattadate Wachirarattanawong , it has been broadcasted on last Sunday of 15th June 2014 at Rangsit Muay Thai stadium by fighting for 3 couple boxers in line A for both real ones and reserve ones. Moreover, for the important real one there will be Kanesarn Sitaekubon ,who just knocked Liamphet S. Thianpho until the committees decided to stop fighting in round 4 that is favored to the Muay Thai fans much. In addition, now Kanesarn can pass into the next round as well. Thus, the lawyer Phit Kaisang or the teamwork revealed that this boxer is indeed the grandson of Satanmeunglek Chanwitkosrang or another severe boxer of Phet Lumphinee Group , so he has the similar style boxing to him. Furthermore, now Kanesarn has his good fortune in this circle to pass into the deeper round. This entry was posted in Uncategorized and tagged camp, Kanesarn, muay thai, Phetyindee, thailand, training on 2014/07/05 by muay thai fighter.